Bioscience is an industry that generates billions each year with surprisingly little visibility. But that could soon change. There’s a multibillion-dollar industry growing in Georgia, but it’s been just under the radar so far. Bioscience – a massive sector encompassing pharmaceuticals, medical devices and equipment, diagnostics, biologics and the burgeoning area of digital health IT – generates more than $15 billion in sales for Georgia each year, yet it remains a hidden industry to those outside it. Thankfully, some are starting to take notice. In its 2015 World’s Most Competitive Cities report, Site Selection magazine named Metro Atlanta the fifth-strongest North American city for life sciences, citing its low cost of living and valuable research centers – and shifting the spotlight a little closer in the process. Over the past 25 years, the GRA has played a key role in the development of numerous biotech breakthroughs, including one of the most prescribed HIV treatment medications in the world. Emtriva, developed at Emory University in the early 1990s, is now taken by nine out of 10 people treated for HIV in the United States. 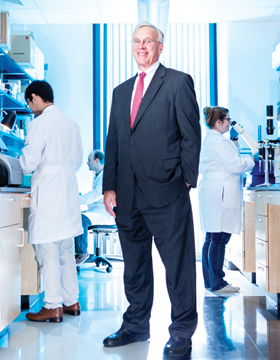 Gilead Sciences and Royalty Pharma purchased Emtriva’s royalty interest in 2005 for $525 million, which has been reinvested at Emory to further research and development in bioscience. Georgia’s universities – and the startups they spin off – have also developed technologies for painless vaccines, earlier detection of autism and Alzheimer’s, and even real-time monitoring of cardiovascular health. CardioMEMS, an implantable device the size of a small paper clip, can transmit real-time data on blood pressure, heart rate and cardiac output from inside a patient’s pulmonary artery. The company was acquired by St. Jude Medical in 2014 for more than $450 million, and a 2011 clinical trial reported a 37 percent reduction in heart failure hospitalizations for patients with the device – proving that the impacts of Georgia’s bioscience industry transcend dollars and cents, as well as state lines. Inside the state, though, the impact reaches the billions. A joint study between the University of Georgia and Georgia Bio, the trade organization for Georgia’s bioscience industry, puts the economic impact of bioscience in the state at $16.7 billion in sales and $6.9 billion in state gross domestic product, with another $1 billion in state GDP from life sciences research at the state’s colleges and universities. Moreover, a 2016 TEConomy Partners/BIO report cites the annual average salary for the bioscience industry in Georgia is just shy of $77,000, with almost 30,000 jobs at 2,047 bioscience organizations. Compared to the average private-sector annual salary of just under $49,000, jobs in the bioscience industry are high paying – and extremely lucrative for the state. Why are these startups and researchers choosing Georgia? It’s a mix of factors, say industry leaders, including Georgia’s low cost of living, pro-growth business environment and strong infrastructure, including easy access to rail and international air travel. Another key factor is the state’s research institutions and research centers, which bolster the industry by boosting its scientific reputation and helping to attract the nation’s best researchers. There are dozens of university research institutions across Georgia, stretching from the University of Georgia’s Complex Carbohydrate Research Center in Athens to the Center for Biotechnology and Genomic Medicine and the Immunotherapy Center, both at Augusta University. The majority, however, are clustered in Metro Atlanta around Georgia Tech, Emory, Morehouse School of Medicine, Georgia State University and Clark Atlanta University. Plus, many are collaborations between and among two or more of these institutions. One such collaboration, the Center for Behavioral Neuroscience, is a consortium of seven institutions: Emory, Georgia Tech, Morehouse College, Morehouse School of Medicine, Spelman College, Clark Atlanta and lead institution Georgia State University. The center was founded in 1999 as a National Science Foundation Science and Technology Center, and its more than 150 neuroscientists’ research includes the roles of oxytocin and vasopressin in social behavior, with the goal of applying discoveries to better understand, detect and treat psychiatric disorders like post-traumatic stress disorder, autism and depression, says its director, Elliott Albers. Current grant-funded research is also investigating the neurobiology behind positive emotions and social behaviors like cooperation, compassion and empathy, as well as the evolution of language and speech in primates. Georgia Tech announced in January a new research center devoted to standardizing the production and testing of living cells. The Marcus Center for Therapeutic Cell Characterization and Manufacturing (MC3M) – the first of its kind in the country – represents a $23-million investment from the Marcus Foundation, Georgia Tech and the GRA. Research conducted in the center’s facilities could lead to more reliable, cost-effective procedures for producing large amounts of high-quality stem cells and immune cells, which can be used in cell-based treatments for diseases like cancer, spinal cord injury, autoimmune disorders and neurodegenerative diseases. And at the Global Center for Medical Innovation (GCMI) in Midtown, startups and researchers can find the valuable resources they need to get their ideas from prototype to market – a feat that might not happen otherwise. Since the GCMI’s opening in April 2012, Wilson’s team has helped more than 60 medical device product teams navigate through product development and regulatory approvals to commercialization, including Atlanta-based NFANT Lab. Born out of the University of Kentucky, NFANT Lab’s research team developed a real-time infant feeding monitoring system that collects and transmits data to improve feeding methods for babies in neonatal intensive care units. What do these research centers – and the dozens of others across Georgia – mean to the state? For one, says MC3M Director Krishnendu Roy, they give the state the tools to attract top researchers from across the country to continue to produce groundbreaking research. Cassidy agrees: “All of the people that we have been involved with in recruiting to the state, they’re all coming here because they see the environment, they see the ecosystem and they see the desire of the state to put the tools and resources in place to do these kinds of things. Metro Atlanta’s valuable assets – nationally recognized research institutions and centers, strong research talent, startup incubators, and easy access to rail and international flights – are big factors in Georgia’s emergence as a national bioscience hub, but they also make another key aspect to success – collaboration – that much easier. Collaboration – both between the state’s research institutions and among the players in its supporting ecosystem – is vital to achieving research goals. It’s also been a motivating factor for the formation of some of the state’s largest bioscience support organizations. At the Center for Behavioral Neuroscience, Albers’ team is working with Mark Wilson, a researcher at Emory University’s Yerkes National Primate Research Center, to study the basic mechanisms involved in social stress under a National Institute of Mental Health grant. This collaboration allows the teams to do parallel studies in hamsters at the center and rhesus monkeys at Yerkes to see if the same mechanisms are at play in the two species. “That adds a whole new dimension to the investigation and brings us a lot closer to clinical impact of these studies,” says Albers. Outside of the lab, collaboration is necessary to take an idea from concept to prototype, and then from prototype to viable commercial product. This need for continued support has sprouted a handful of university incubators and tech transfer centers, as well as supporting centers like GCMI. It’s also led to increased funding sources, like the Bio/Med Investor Network. Launched in 2015, the network provides angel funding for bioscience, medical technologies and digital health companies. In its first year, the network invested more than $1.5 million in five companies, says Georgia Bio President and CEO Russell Allen. Though Georgia’s bioscience industry has grown substantially in recent years, there’s still a lot of work to be done. Industry leaders point to the need for more bioscience management talent to take startups from early commercialization to sustained development. There’s also the funding gap between product development and commercialization – “jumping the chasm,” as Malice puts it. Many companies make it through development with a viable product, but bringing it to market successfully is still a daunting challenge for many, from both a funding and leadership perspective. Tackling these problems will require a sustained, focused and collaborative effort from all of the industry’s key players. “I see it as a never-ending exercise,” says GCMI’s Wilson.